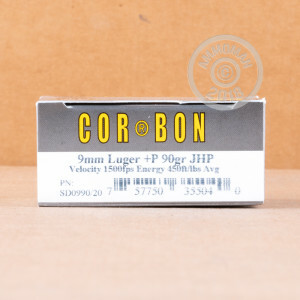 This 9mm Luger ammo from Corbon provides reliable defensive power for subcompact concealed carry pistols, delivering consistent expansion even from the short barrels of guns like the Springfield XDs, Smith & Wesson M&P Shield, and Glock 43. It is a +P load firing a light 90 grain jacketed hollow point bullet at a very high muzzle velocity of 1,500 feet per second. This velocity helps the projectile dump all its energy in the target and expand to incapacitate an assailant quickly. Although it is a +P load, this ammo maintains reasonable recoil levels due to the light weight of the projectile used. Nevertheless, it should only be used in firearms rated for high pressure ammunition. These cartridges come in boxes of 20 and are loaded in Sturgis, South Dakota using reloadable brass cases and non-corrosive Boxer primers. 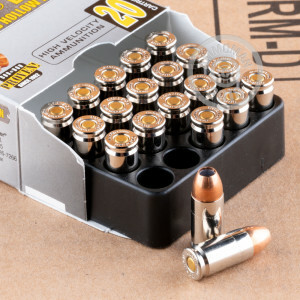 Get all the ammo that's fit to shoot at AmmoMan.com--and free shipping if your order total exceeds $99!